In the wake of Windows 10 Fall Creators Update (Version 1709), lots of interesting wrinkles are emerging. A raft of Hyper-V changes in this release are spelled out in a new Virtualization Blog post from Microsoft. Dated 11/13/17, it’s entitled “What’s new in Hyper-V for Windows 10 Fall Creators Update?” Among the various new items it spells out, there’s an item that reads “Hyper-V has a Default Switch for easy networking.” Having just tried it out myself, I can affirm that this Default Switch makes Hyper-V networking dead simple. When picking a virtual NIC in Hyper-V, Default Switch is your new go-to option. How Is It That Default Switch Makes Hyper-V Networking Dead Simple? As the foregoing screenshot shows, an option named “Default Switch” now shows up whenever you’re asked to select a network interface or to identify network-based resources. It comes as part of the runtime environment, by default as it were. Having struggled to identify the right NIC on a Hyper-V host with two GbE interfaces (where only one was connected), I’ve had bonehead problems with Hyper-V networking on earlier versions of the software. But with this new default option, you can pick simple, basic networking as a menu item as soon as you turn Hyper-V on. It doesn’t get a whole lot simpler than this, nor easier to use. Highly recommended! 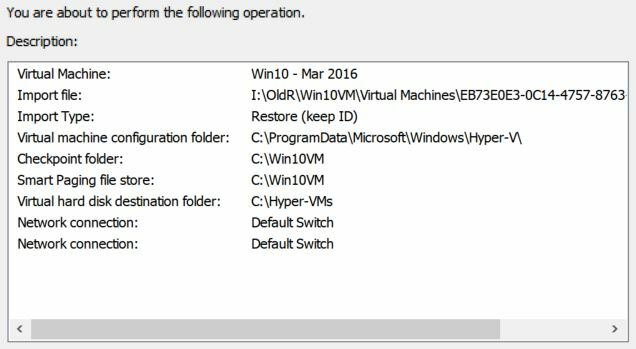 What Else Is New in Version 1709 Hyper-V? Quick Create Gallery: a quick create button in Hyper-V Manager can reference a gallery of pre-defined OS images, to which you can add your own items. This capability is still under construction, though, as the following 11/8 post to the same blog explains “Create your custom Quick Create VM gallery.” I’m waiting for the promised documentation to show up to avoid hand-crafting the necessary JSON documents. Easy to revert VMs to their start state: Hyper-V now creates a checkpoint each time you start a VM. That means you will always have a reasonably current checkpoint to which you can revert for all your VMs. Host battery state visible in VMs: means that you can tell how much battery life is left from inside a VM running on a battery-powered PC. Virtual machines are easier to share: A new “Share” button packages and compresses VMs to make them easier to move to another Hyper-V host using the Virtual Machine Connection facility.